What Are Some Common Items That I Should Never Put down the Drain? - Jar-Dab Plumbing, Inc.
What Are Some Common Items That I Should Never Put down the Drain? It’s a horrible sound, one that anyone dreads hearing as they try to rinse the dishes: that hollow “gurgle” that heralds in a clogged drain. Indeed, as you try to maintain a clean, sanitary kitchen, you’ll find that a properly working sink is invaluable. But with all the stuff you might find yourself putting down your sink, you might find that maintaining a working sink isn’t always doable. Of course, you don’t HAVE to accept a routinely clogged sink as an inevitability. After all, many clogged sinks occur when you put certain items down the drain — items that have no business EVER going down your drain. Do you want to keep your kitchen as clean as you can? Then keep your sink from making the dreaded “gurgle” that indicates a clogged drain. And how do you do that? Easy: by reading Jar-Dab Plumbing Service’s quick guide about some common items you should NEVER pour down your drain! Grease and oil are some of the most common items that people put down their drain — which is unfortunate since grease and oil are also something that can stop up a sink like nothing else. After all, grease and oil can congeal, and when they do so, they can create water-resistant blockages that require some serious work to bust loose. If your cooking produces a good deal of grease and oil (including salad dressings), don’t throw that grease and oil down the drain. Instead, place those materials in cans and jars and dispose of them elsewhere. Nothing wakes you up in the morning like a good, strong cup of coffee. Of course, you can’t have coffee without producing coffee GROUNDS — something which you won’t have any real use for. So, when you’ve slugged your last mug of Joe, what do you do with those grounds? Get rid of them, of course. And since your sink is likely in close proximity to your coffee machine, you might be tempted to simply wash those grounds down the drain. BUT RESIST THAT TEMPTATION! Coffee grounds are not fully water soluble, and if they catch onto a developing grease clog, you’ll be dealing with the Perfect Storm of drain clogs. Instead of putting coffee grounds down the sink, consider putting those grounds to good use as compost. If you’re not THAT green, then at the very least throw those grounds in the trash instead of the sink. Have you ever thought, “Boy, that doesn’t look like a lot of rice. I’ll go ahead and double it” as you prepare dinner — only to wind up making enough rice to feed a small village for a week? Have you ever done the same with pasta? Very likely. After all, though rice and pasta are fairly small when they’re dry, as you combine them with water, they grow SUBSTANTIALLY. That’s why pasta night most always turns into pasta WEEK. While this expansive design is certainly good for your appetite, it’s not QUITE so good for your drain. After all, what goes down your drain more than anything? Water, of course. And if you chunk pasta and rice down the drain, they’ll combine with water and just grow and grow and grow until you have a tasty but QUITE stubborn clog on your hands. Don’t turn your kitchen sink into a rice bowl or a pasta salad. Throw your old rice and pasta dishes in the trash — not down the kitchen sink. Flour is good for a lot of things. You can use it to make bread, pizza dough, sauces . . . and glue, of course. If you want to try your hand at paper mache, you’ll find flour to be a necessity. Likewise, if your goal is to get your sink as absolutely clogged as can be, then you can’t go wrong with flour. Just pour some down the drain, and you’ll have a sink that’s just about as clogged as they come! While you’ll probably never pour flour down the drain because you WANT to get it clogged, a clog is exactly what’s going to happen if you pour enough flour down the drain. After all, once water combines with flour, you’ll have a resilient paste that’ll gum up your pipes like nobody’s business. If your baking or paper mache projects or whatever else leaves you with extra flour, then throw that flour straight in the trash. It has no place in your kitchen sink! No matter how careful you are with your kitchen sink and what you wash down it, at some point, a clog could become inevitable. That’s just how things work. And should your kitchen sink become clogged, don’t stress yourself. Just call up the Colony’s experienced plumbers at Jar-Dab Plumbing Services. We have the expertise and the know-how to get even the most stubborn clog knocked out in no time flat! 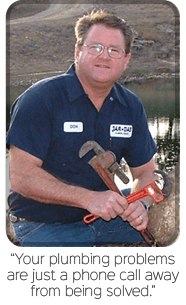 If you are looking for drain cleaning in the The Colony area, please call Jar-Dab Plumbing, Inc. at 972-625-0083 or fill out our online request form.